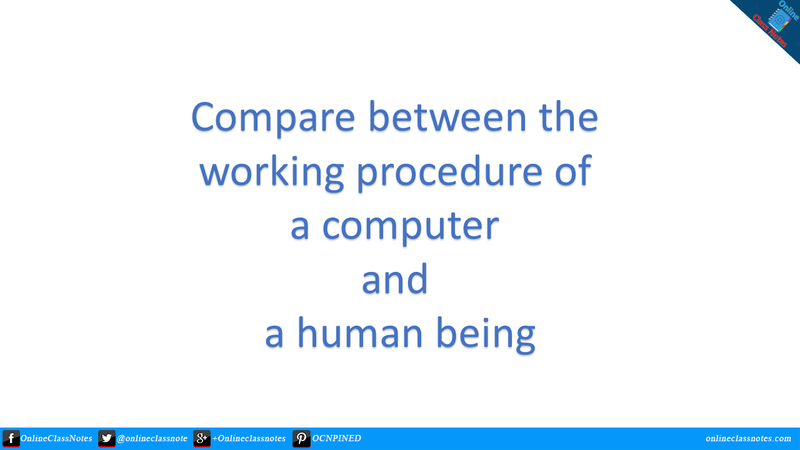 There are some similarities between the working procedure of a human being and a computer. 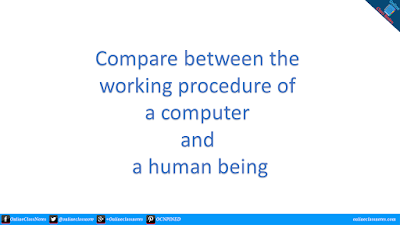 The main deference is that human has a sense using which it takes decisions and perform a task by itself, whereas a computer need instructions or data to perform a task. Otherwise, both of them work through a similar way. Such as first of all these take input and then processes the input to generate output (if necessary). A computer takes input from various input devices such as keyboard, mouse etc. and human takes input using various limbs such as ears, eyes etc. A computer processes it's data using the processor and instructions written in software. On the other hand, human uses it's brain to process data. Computer can output through the connected output devices such monitors, printers etc. Human can use it's different parts of the body to output such as mouth etc. Computer can keep data and information stored in it using connected storage devices such hard disks, optical disks etc. To store anything human uses brain. Computer can process data in a very short time which we measure in nanosecond (1 nanosecond = 10^9 seconds) where the speed of human being measures in seconds, minutes etc. Computer can make accurate results of any calculation where a human being can make mistakes. A computer will only output wrong result if the instruction it is following to execute the task has fault. A machine will never be tired, but human will certainly feel tiredness.